“If by life you were deceived, then you deceive it back,” adapted from the poem of Aleksandr Pushkin. Imagine your life as a game, walk out from the daily principles, liberate yourself through games and make discoveries from the unknown. And you may find so much possibilities in you in so many aspects. This is the start of “Chi-Tou.” And it can be the new start of your life. Putting away the everyday hassle. 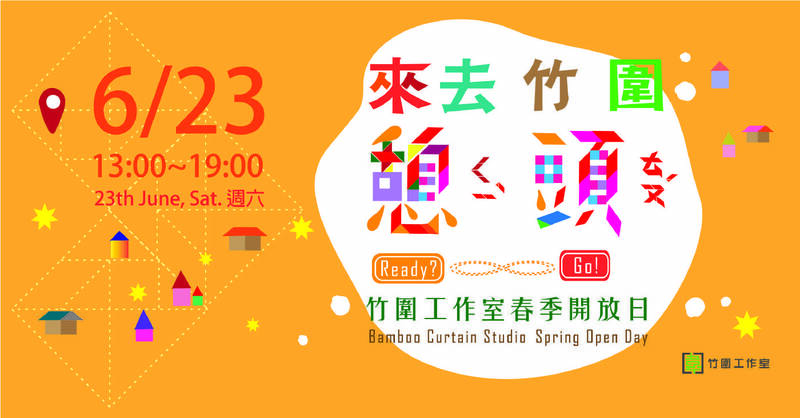 Bamboo Curtain Studio invites everyone to join us for our Spring Open Studio Day of this year. We will have our long-term artist-in-residency: Ceramic artistic Joan Chang and play drums with Sun Son Theatre group. The artist will open up the doors that is hidden from your regular eye levels. Also, our international artists— Hidemi Nishida from Japn, Madhu Das and Parag Tandel from India and Lua Rivera from Mexico will showcase their works and projects. And of course, our Taiwanese artists including Chou Chien Pang, You Jhu Jyun, Taiing Studio and environmental artist and dancers to present exhibition of Recycle Plastic Art. Aside from the artist exhibitions and talks, you can also enjoy the workshops of handmade crafts, including silk printing, handmade paper and eco-pens. And we will have environmental friendly and art market. Crafts, Art, Food and drinks will all be served to you! Come and join us right at Bamboo Curtain Studio Open Day on June 23!